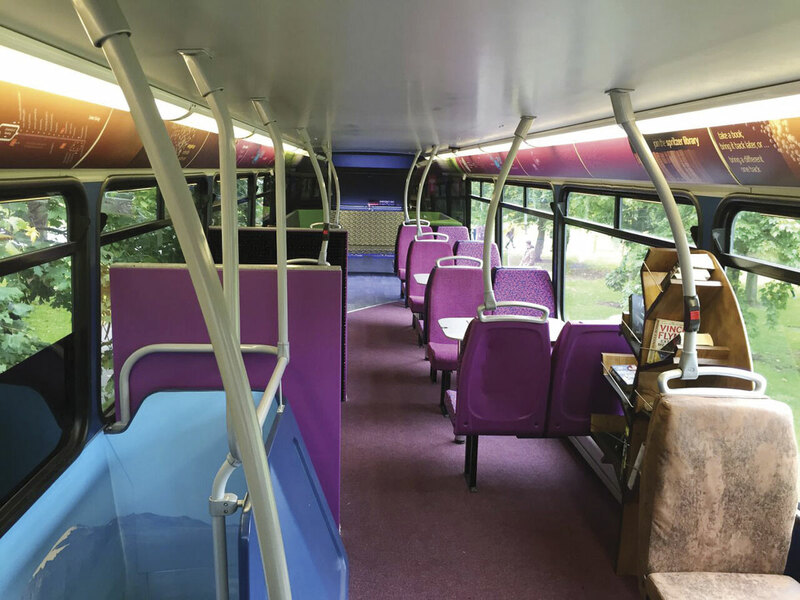 As part of its student offer for the 2015-16 university year, Reading Buses have launched a pioneering on-board experience for users of its claret services between Reading Station and the University of Reading Whiteknights Campus on weekdays during term time. Working in partnership with design agency, Best Impressions, and refurbishers, South East Coachworks, four Scania OmniDekka buses have received a completely re-designed upper deck in a zonal concept that features a plush lounge area, games pod with a gaming tablet and desktop games, table seating area and a micro library with an honesty book exchange service. Named claret spritzers to distinguish them from the parent claret 21 service, the vehicles’ fully carpeted upper deck also includes a music juke box for customers sitting in the rear lounge seats can connect to via Bluetooth or a cable. As well as free super-fast 4G Wi-Fi and USB chargers throughout, what are thought to be the world’s first contactless charging pads on public transport, to the qi inductive power standard, will also feature on-board. A refreshed but conventional bus layout will remain in the lower deck with both wheelchair space and buggy bays. Martijn Gilbert, Reading Buses Chief Executive Officer, explained: ‘Due to recent changes in our fleet, we had an excellent opportunity to trial something a bit different on board the buses operating the university extra journeys on our claret 21a service. 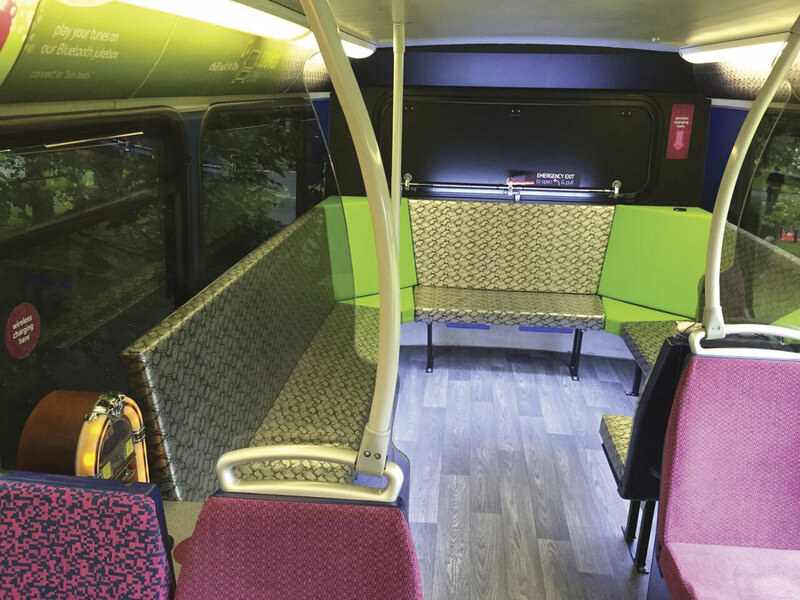 As a company which is always seeking to innovate and continually improving its service offering, we hope that by pushing the boundaries of seating layouts and harnessing the latest technologies these rather different buses will create quite a buzz about bus travel in Reading. We want people to be enthused about buses around the university and encourage even more students, staff and visitors on board. In addition, the new ADL Enviro 400 MMC buses introduced on the main claret 21 route last November are being upgraded with at seat USB phone and tablet charging points and super-fast 4G Wi-Fi.